Our 'pour boys' wine group toured the Frank Lloyd Wright Home & Studio in Oak Park, followed by the neighborhood walking tour featuring iconic Wright homes. As a docent/interpreter for the FLW Trust, I arranged and presided over our group tour. 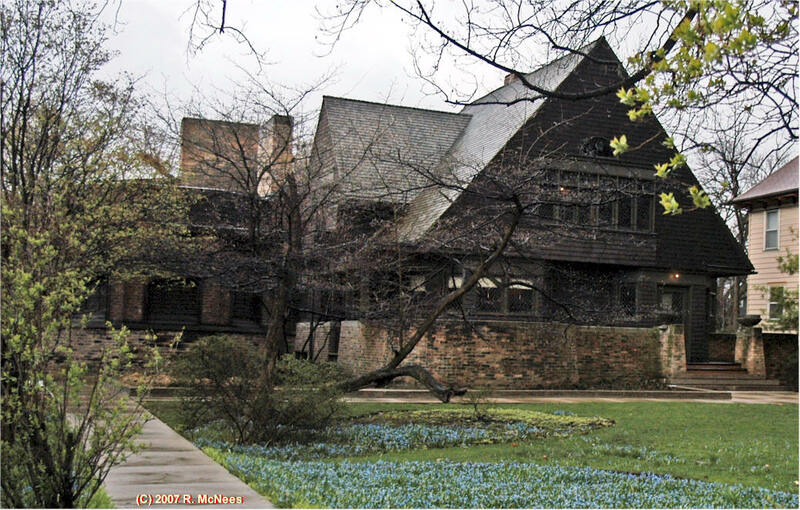 Our custom tour focused on Wright's nearby 'bootleg' homes, the classic prairie style Heurtley House, the Nathan Moore and adjacent Hills House, the Beachy House, FLW's first complete prairie style home, the Frank Thomas House, and the Laura Gale House. Afterwards we dined at Hemingway's Bistro Restaurant in the quaint Wright Inn, a few blocks away, near Hemingway's boyhood home, across the street from the Hemingway Museum. Their semi-private room in the back overlooking the restaurant provided the perfect comfortable intimate setting for our dinner group assemblage. 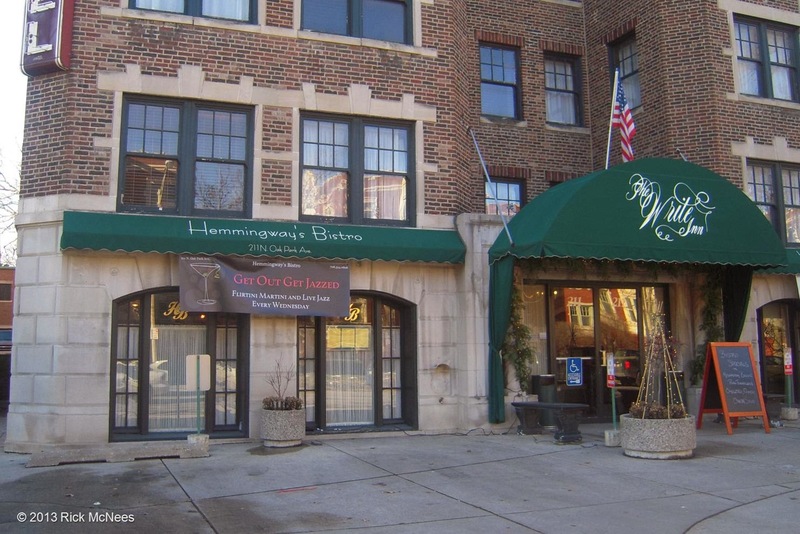 The Hemingway's Bistro French inspired cuisine provided an ideal accompaniment and setting for our BYOB French centric wine flight. The staff, lead by our server Aron, did a spectacular job attending to our group of twenty, serving dinner and accommodating the preparation and service of our wines, making for a wonderful delightful dinner evening. They set an adjacent table for showcasing and preparing our wines and provided fine wine glassware for reds, whites and champagne. 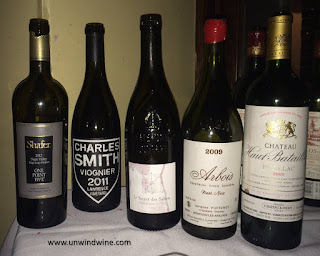 Our group has no less than five current period weddings to celebrate and we'll have two grandchildren born this year so there was much to toast and commemorate with our wines. 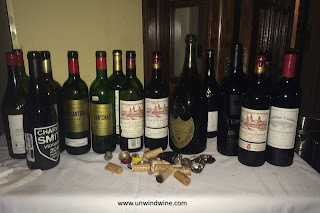 To that end, our wine flight selections featured several notable vintage years with wines from 1970, 1976, 1981,1982, 1988, 1989, 1991 and notable wine vintages such as 2000. We also got a first look at some recent releases. Recent posts in these pages have highlighted our wine tastings at Bill and Beth's, and Dan's recent wedding celebrations. For a starter, I brought a magnum of Moët & Chandon Dom Perignon Champagne, 1976. Regretably, the cork of this bottle had failed recently and this bottle was corked. From our cellar I sourced a vertical flight of Cos d' Estournal St Estephe Bordeaux for Eric & Cathy, Kay, and Linda and I to offer. George was amazed we were holding these wines this long. I stated that's the fun of special anniversary/birth year vintage bottles. Moreover, I explained how we learned over time that we drank many of our Bordeaux, especially from the eighties, too early! 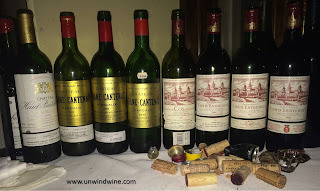 Look how these old Bordeaux held up and showed well, even those at ages supposedly past their drinking windows! Every one met or exceeded expectations. Cos d' Estournal St Estephe Bordeaux 1989 - Bill and Beth's son Matt's birth year who is engaged and will wed in the coming year. We also had a vertical flight of Brane Cantenac Margaux Bordeaux. Brane Cantenac Margaux Bordeaux 1970 - brought by Ryan, graduation year for many of us. Another amazing showing for a wine incredibly 45 years old ... testament to the stamina and aging potential of quality Bordeaux, still holding vibrant fruit, amazing floral tones and no signs of serious diminution. 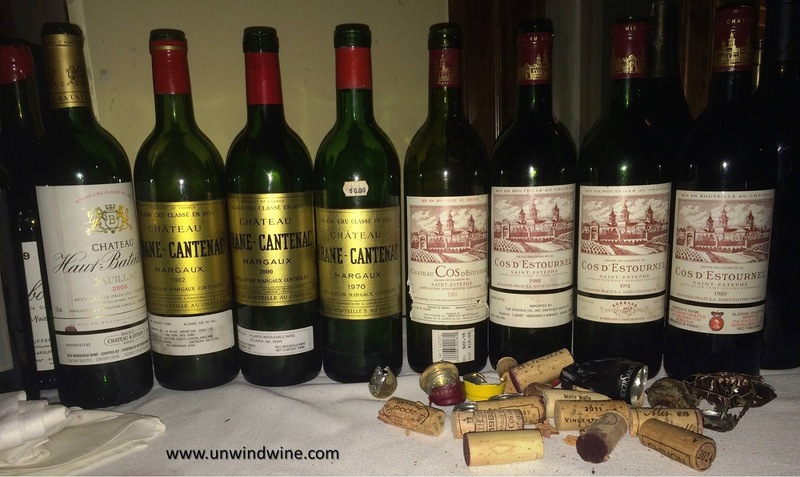 Brane Cantenac Margaux Bordeaux 2000 - a legendary Bordeaux vintage, brought by son Ryan. Two classic showings from two classic vintages, the '82 appearing much lighter than expected. Bill also brought another 2000 Bordeaux, Chateau Haut Batailly Pauillac 2000. 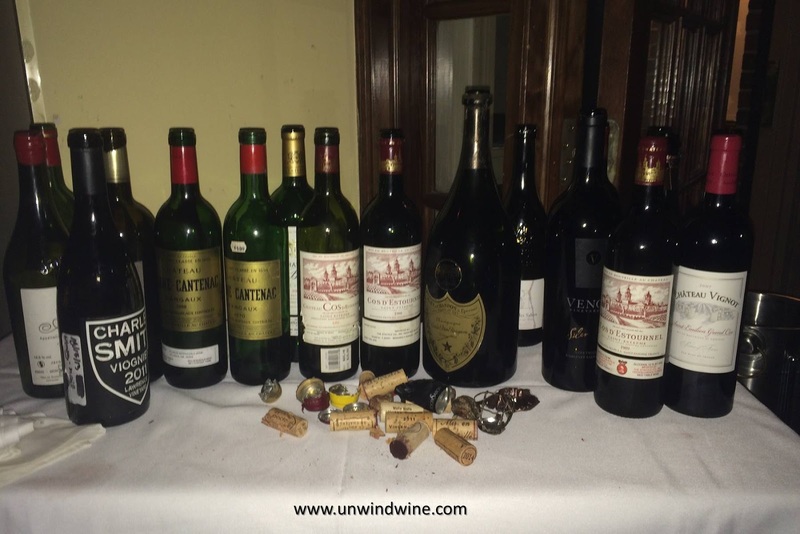 Both 2000's showed their breadth and depth of fruit accented by classic Bordeaux floral, earthiness and tobacco leaf with muscular but approachable sinewy polished tannins. Le Secret des Georges Sabon Chateauneuf-du-Pape - 2011 - One of the highlights of the tasting, showing its big bold forward complex fruits, almost overpowering the sophisticated but comparatively more delicate Bordeaux's. 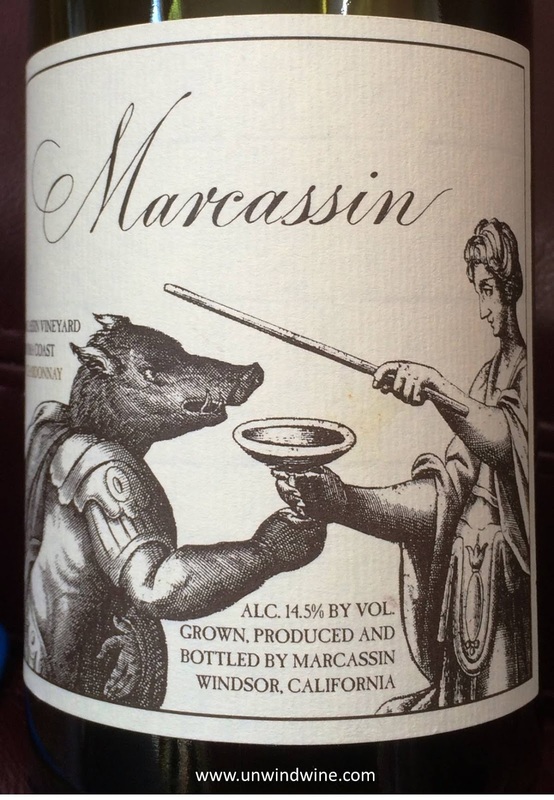 Marcassin Marcassin Vineyard Sonoma Coast Chardonnay 2010 - Smooth, polished, rich, consensus accolades as one of the best Chardonnay tasting experience ever! Nils Venge Senecleaux Napa Valley Red Wine 2013, just released and tasted for the first time. This was a huge hit. We're long time friends of Nils Venge and have much experience with his wines. We've collected several vintages of this label but this was our first tasting of such. A great showing with big forward berry fruits accented by sweet vanilla oak. Apologies to anyone if I missed or mis-atributed any wine (s). For starter courses when seated, Chef Ala prepared and served his Baked Brie in puffed pastry with almond and honey which was perfect with the starter champagne and white wines, and his chicken liver pate on toasted baguette. Several folks had the roasted beet salad while Dan and I feasted on the foie gras. From the menu, many folks had Chef Ala's Saturday Night Special Beef Wellington. Dan had the Mixed Grill, I had the New York Strip au poivre with creamed spinach, George had the Prawns. Many of the entree's featured Chef Ala's signature pommes au gratin. After dinner several folks had the special Souffle, and others had the Creme Caramel, the Warm Apple Tart, and I had the decadent Mousse au Chocolate with raspberry coulis that was a chocoholic's delight.